Introduction: Pulp necrosis is a common consequence of extrusive luxation in mature teeth with complete apical closure. In this report, the researchers presented a case with severely extruded mature mandibular incisors (more than 5 mm), which did not lead to pulp necrosis. Case Presentation: The case was a nine-year-old female with severe dentoalveolar trauma to the anterior maxillary and mandibular region, as a result of a bicycle accident. The treatment consisted of mandibular alveolar bone and central incisors repositioning. After 18 months of follow-up, no sign of pulp necrosis was observed. Conclusions: In young patients with severe extrusive luxation and closed apices, there is the potential for pulp survival, and early endodontic treatment should be avoided until signs of pulp necrosis is observed. Trauma to the oral cavity occurs repeatedly, and comprises of 5% injuries in people that look for treatment (1, 2). Among all facial damages, dental injuries are the most common (1, 2), of which luxations and crown fractures occur the most (1, 3). For a good prognosis, an appropriate treatment plan after an injury is important. Extrusive luxation is an injury characterized by partial axial displacement of a tooth (4), tear of the periodontal ligament along with injury to the apical vessels (1). Clinically, the damaged tooth appears elongated, usually displaced in the palatal direction, and indicates excessive mobility (5, 6). Radiographically, the teeth appear to have an increased periodontal ligament space (6, 7). After extrusive luxation, the apical development stage is a key factor in pulp healing (6, 8, 9). In a patient with open apices, the pulp has the potential to heal, usually following pulp canal obliteration. In teeth with closed apices, the probability of pulp revascularization is low, which leads to pulp necrosis (4, 6, 8, 9), and can often be detected within the first eight weeks (10). Dumsha and Hovland investigated pulp necrosis after extrusion in 52 teeth with closed apices and observed that 51 teeth were necrotized. They concluded that teeth with fully mature root development were forcefully separated from their blood supply and were not expected to recover when reinserted in their previous position (11). Lee et al. examined extruded permanent maxillary incisors of children and adolescent during 1320 days of follow up, and within the subset of severe extrusion, six out of seven incisors developed pulp necrosis (6). Humphreys classified extrusive luxation to three categories: extrusions smaller than or equal to 3 mm were considered mild, between 3 and 5 mm moderate, and larger than 6 mm as severe. He demonstrated that for severely extruded teeth and for those with closed apices, the risk of pulpal necrosis was greatest (10). In this type of injury, treatment comprises of repositioning of the tooth by mildly reinserting it to the tooth socket, and stabilizing the tooth for two weeks using a flexible splint. Monitoring the pulpal status is necessary to diagnose root resorption. In immature teeth, revascularization can be conﬁrmed by evidence of continued root formation and pulp canal obliteration, radiographically, which usually returns to the response to sensitivity testing. In fully formed teeth, a continued lack of response to sensitivity testing should be taken as evidence of pulp necrosis along with periapical radiolucency and sometimes crown discoloration (12). Once pulp necrosis is diagnosed, endodontic therapy should be initiated to eliminate any infection, to facilitate healing and retention of the tooth (6). This paper aimed at reporting the management of a severe case of extruded anterior mandibular incisors with closed apices. In this case, the left and right central incisors and the right lateral mandibular incisor teeth had not become necrotic during the 18 months follow up, even with severe extrusion and closed apices; the sensitivity tests were positive after 12 months. A healthy nine-year-old female was referred to the trauma center of Shiraz school of dentistry, two days after an injury to her face and jaws, due to a bicycle accident. No previous trauma was reported. Extra-oral examination disclosed contusion of chin, lips, and nose. Torn and bleeding gums were observed during the oral examination (Figure 1A). The maxillary central incisors were avulsed and had been replanted by a general dentist, and stabilized with a wire around the cervical margin one day after the injury had occurred (Figure 1B). The buccal cortical bone was completely destroyed in the region of maxillary central incisors. Furthermore, the anterior alveolar mandibular bone had segmental fractures in the areas of left and right central incisors, and the right lateral incisor had moved towards the lingual side (Figure 1D). The left and right central incisors and the right lateral mandibular incisor were severely extruded. The teeth were very sensitive to percussion, yet non-responsive to cold and electric pulp testing. The patient had spontaneous pain in the area of maxillary and mandibular incisors. The adjacent incisors displayed normal mobility. According to the periapical radiography, the roots of left and right central and right lateral mandibular incisors were fully formed, and the apices were completely closed. The periodontal ligament space had widened by more than 5 mm (Figure 1E). After administering local anesthesia to the upper and lower jaws, the wire was removed from the maxillary central incisors; then, the incisors were replanted in their appropriate place and splinted using a flexible 0.5 mm wire (Figure 2A). In the lower jaw, the alveolar mandibular bone and the teeth were first positioned in their correct place, then splinted using a flexible 0.5 mm wire (Figure 2B). Next, radiography was taken to ensure correct positioning of the teeth (Figure 2C and 2D). Occlusal adjustment was made to prevent occlusal traumatic interference. Hygiene instructions were provided. Systemic penicillin for seven days and daily mouthwash with 0.12% chlorhexidine digluconate was prescribed. Endodontic treatment of the maxillary central incisors was started seven days after replantation. In this regard, after mechanical and chemical preparation of root canals, canals were filled with calcium hydroxide. Final filling of the canals took place 30 days later. Since it was not possible to obtain a good tug-back with gutta-percha, the root canals were sealed using MTA (Dentsply, Tulsa Dental, Tulsa, OK, USA). The rest of the canals were backfilled using gutta-percha and AH26 sealer (Dentsply; DeTrey, Konstanz, Germany). Teeth were restored with composite resin (Figure 3A and 3B). After examining the looseness of the teeth, the splints were removed after six weeks (Figure 3C). In the lower jaw, the teeth did not respond to the sensitivity tests; however, since there were no signs indicating necrosis, the researchers did not find endodontic intervention necessary. Figure 2. 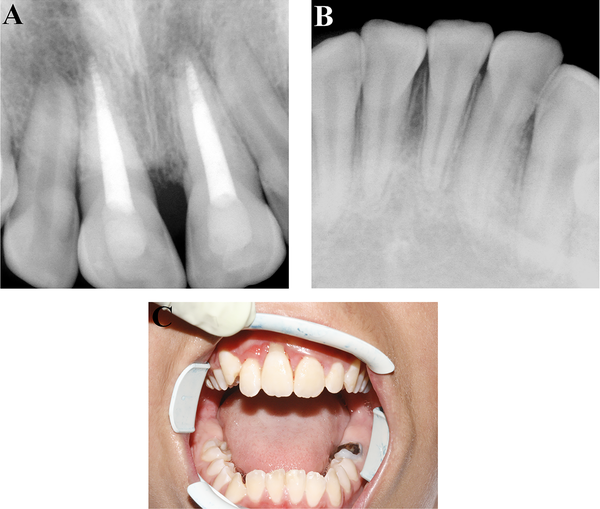 A, B, Clinical appearance of wire-composite splinting of maxillary and mandibular incisors; C, D, Radiography was taken to ensure correct positioning of the teeth, The splint was extended to the primary canines. Figure 3. A, B, Endodontic treatment of the maxillary central incisors; C, The splints were removed after 6 weeks. 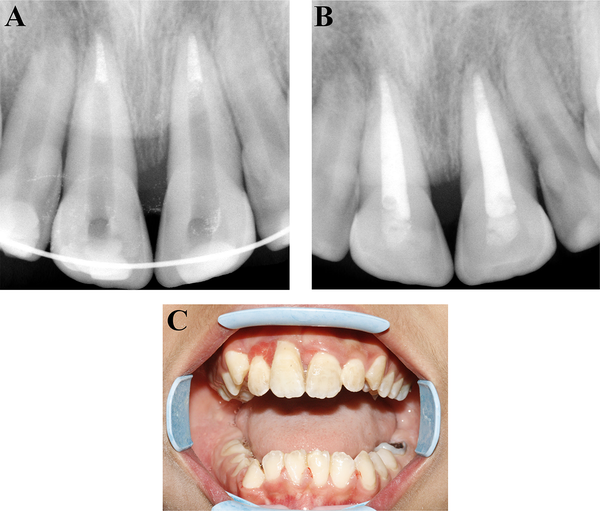 In clinical and radiographic follow-ups, three, six, nine and twelve months following the procedure, the mandibular incisors showed no signs of necrosis and were not sensitive to percussion and palpation tests. There were no mobility, probing defects or discoloration. Radiographically, there was no apical pathosis, root resorption, ankylosis or marginal bone loss. The teeth still did not show any sign of necrosis after the 18-month follow-up (Figure 4A - 4C). The right central and right lateral mandibular incisors responded to the cold and electric tests, yet the left central incisor showed no response to any of the tests. Due to lack of signs indicating necrosis, an endodontic intervention was not performed. The patient is still undergoing follow-up. Figure 4. Radiographic (A, B) and Clinical (C) appearance at 18 months follow-up; Normal color of the crowns and normal position of the teeth is seen. The urgent treatment of extruded teeth consists of precise repositioning of the tooth in the alveolar socket (1, 7). A non-rigid splint should be applied to fix the tooth and avoid moving incisally. Splint should be retained until the beginning of periodontal healing, to cause a decline in mobility (1, 13). The duration of splint recommended for extrusion is two weeks, and for alveolar bone fracture is four to eight weeks (14). In this case, splint was removed six weeks later after assessing teeth mobility, because extrusion of teeth was accompanied by alveolar bone fracture. 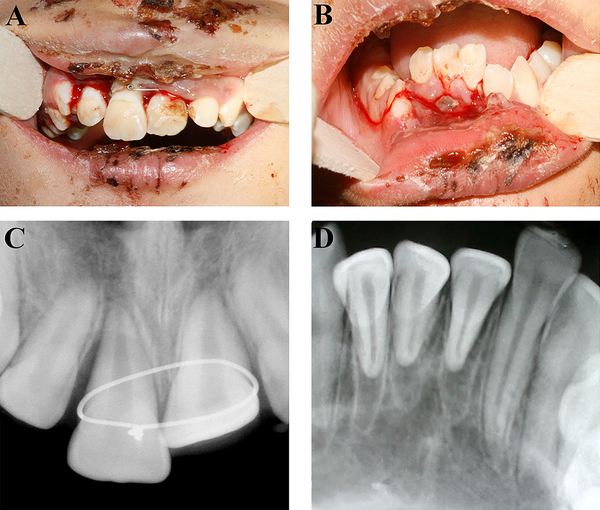 Extrusive luxation injuries make up nearly 2.6% of all traumatic injuries to the dentition, with subsequent pulpal necrosis, as the most common consequence (7, 15). In this case, severe extrusion (> 5 mm) of the teeth with closed apices did not lead to loss of pulp vitality. Duell showed that buccolingual root development was slower than mesiodistal root development, yet a radiographically appearing mature root may have open apex buccolingually. Duell further stated that in permanent incisor teeth, the lag between mesiodistal and buccolingual development usually exists for more than three years after eruption, and in some cases, until 15 years of age. Thus, it is possible that young patients (aged 7 to 15) may have open or partially open apices, even though the apices appear closed, radiographically (16). It has been shown that it may take as long as nine months for normal blood flow to return to the coronal pulp of a traumatized fully formed tooth. As circulation is restored, the responsiveness to pulp tests might return (14). The right central and right lateral mandibular incisors responded to the cold and electric tests after the 12-month follow-up. Some authors suggested routine endodontic treatment for extruded teeth with complete root formation, due to high incidence of pulp necrosis in traumatic teeth with complete root formation. In contrast, immature teeth should be managed by pulpal monitoring and radiographs, and for cases where pulpal necrosis occurs, endodontic treatment should be performed. Other authors stated that all traumatically extruded teeth with open or closed apices should be monitored regularly, and in cases where signs of pulp necrosis appear, endodontic treatment should be initiated (17, 18). In this patient, the sensitivity tests did not provide reliable responses in the recall visits; yet endodontic intervention was not performed as the teeth showed no signs of necrosis. There were also no signs of crown discoloration, periapical lesions or gingival recession. Results of this case report showed that in young patients, with closed apices, the dental pulps might be alive following trauma. In such cases, short-interval clinical and radiographic follow-ups are necessary, yet endodontic treatment must be avoided until the appearance of signs indicating necrosis. In this study, follow-ups were done once a week during the first month, and the next follow-ups were scheduled for the third, sixth, ninth, twelfth and eighteenth month. The sensitivity tests showed response in the 12th month. The author wish to thank Mr. H. Argasi at the research consultation center (RCC) at Shiraz University of Medical Sciences for his invaluable assistance in editing this manuscript. 1 Andreasen JO, Andreasen FM, Andersson L. Textbook and color atlas of traumatic injuries to the teeth. 4 ed. Oxford: Blackwell Munksgaard; 2007. 2 Petersson EE, Andersson L, Sorensen S. Traumatic oral vs non-oral injuries. Swed Dent J. 1997;21(1-2):55-68. [PubMed: 9178450]. 3 Glendor U, Halling A, Andersson L, Eilert-Petersson E. Incidence of traumatic tooth injuries in children and adolescents in the county of Vastmanland, Sweden. Swed Dent J. 1996;20(1-2):15-28. [PubMed: 8738905]. 4 Andreasen J, Andreasen F, Bakland L, Flores M. Traumatic dental injuries: a manual. 1 ed. Copenhagen: Munksgaard; 2000. 5 Andreasen F, Andreasen J. Luxation injuries. In: Andreasen F, Andreasen J, editors. Textbook and color atlas of traumatic injuries to the teeth. 3 ed. Copenhagen: Monksgaard; 1994. 318 p.
6 Lee R, Barrett EJ, Kenny DJ. Clinical outcomes for permanent incisor luxations in a pediatric population. II. Extrusions. Dent Traumatol. 2003;19(5):274-9. [PubMed: 14708652]. 7 Andreasen JO. Luxation of permanent teeth due to trauma A clinical and radiographic follow-up study of 189 injured teeth. Eur J Oral Sci. 1970;78(1-4):273-86. doi: 10.1111/j.1600-0722.1970.tb02074.x. 8 Andreasen FM, Zhijie Y, Thomsen BL. Relationship between pulp dimensions and development of pulp necrosis after luxation injuries in the permanent dentition. Dent Traumatol. 1986;2(3):90-8. doi: 10.1111/j.1600-9657.1986.tb00133.x. 9 Andreasen FM, Pedersen BV. Prognosis of luxated permanent teeth - the development of pulp necrosis. Dent Traumatol. 1985;1(6):207-20. doi: 10.1111/j.1600-9657.1985.tb00583.x. 10 Humphreys K, Al Badri S, Kinirons M, Welbury RR, Cole BO, Bryan RA, et al. Factors affecting outcomes of traumatically extruded permanent teeth in children. Pediatr Dent. 2003;25(5):475-8. [PubMed: 14649611]. 11 Dumsha T, Hovland EJ. 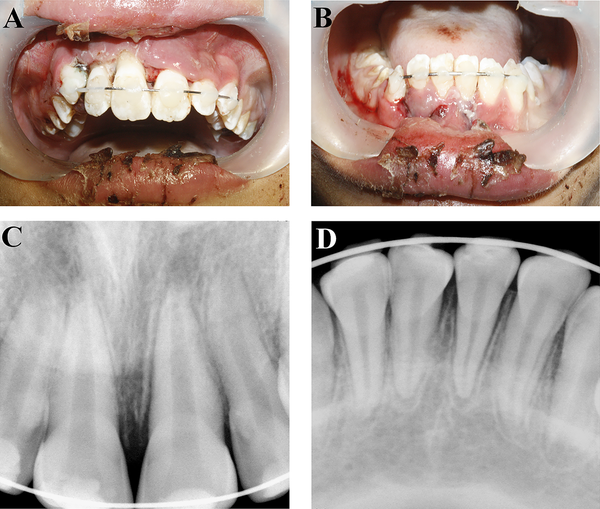 Pulpal prognosis following extrusive luxation injuries in permanent teeth with closed apexes. J Endod. 1982;8(9):410-2. doi: 10.1016/s0099-2399(82)80096-4. 12 Flores MT, Andersson L, Andreasen JO, Bakland LK, Malmgren B, Barnett F, et al. Guidelines for the management of traumatic dental injuries. I. Fractures and luxations of permanent teeth. Dent Traumatol. 2007;23(2):66-71. doi: 10.1111/j.1600-9657.2007.00592.x. [PubMed: 17367451]. 13 Mackie IC, Blinkhorn AS. Dental trauma: 3 splinting, displacement injuries and root fracture of immature permanent incisors. Dent Update. 1996;23(4):140-2. [PubMed: 8948173]. 14 Trope M, Barnett F, Sigurdsson A, Civian N. The Role of Endodontics After Dental Traumatic Injuries. In: Ilan R , editor. Pathways of the Pulp. 11 ed. los Angeles, california: Elsevier Mosby; 2015. 15 Hedegard B, Stalhane I. A study of traumatized permanent teeth in children aged 7-15 years. Part I. Svensk tandlakare tidskrift. Swed Dent J. 1973;66(5):431-52. 16 Duell RC. Conservative endodontic treatment of the open apex in three dimensions. Dent Clin North Am. 1973;17(1):125-34. [PubMed: 4508939]. 17 Feiglin B. Dental pulp response to traumatic injuries - a retrospective analysis with case reports. Dent Traumatol. 1996;12(1):1-8. doi: 10.1111/j.1600-9657.1996.tb00087.x. 18 Newton CW. Trauma involving the dentition and supporting tissues. Curr Opin Dent. 1992;2:108-14. [PubMed: 1355674].